And why is it racist, exactly? Oh, because wouldn’t you just know it? Valerie Jarrett is a WOMAN OF COLOR! She had a Great-Grandfather named Robert Robinson Taylor who himself had a white father and a black mother. Which makes Valerie Jarrett… not a quadroon. Not an octaroon. So Roseanne’s show got cancelled because this was apparently a violation of Hollywood’s moral sensibilities. And just to be clear, we here are Neon Revolt do not endorse the idea that Valerie Jarrett looks anything like Zira, from Planet of the Apes. No, no, no resemblance whatsoever. What is Roseanne even going on about? But in all seriousness, did you have any idea Jarrett had any African blood in her at all? My guess is Roseanne didn’t, either. My guess is that she looked at her and thought “White? Vaguely Middle Eastern?” and followed through in her pursuit of comedy. And the Hollywood Cabal was just looking for any excuse to kick her out. Doesn’t matter how much money her show was making; she had to go the second they got an excuse! They were probably already talking about ending the show, because they can’t be accused of giving her a platform. If that’s the case, no doubt Roseanne knew and decided to lob a molotov tweet their way. I wouldn’t blame her. And don’t forget: all this “outrage” is coming from the same people who have been calling Trump an Orangutan almost nonstop for the past three years. I mean, really. Just run the search yourself. You’ll have your pick from literally MILLIONS of angry, disgruntled Leftaroonie tweets at your fingertips containing these exact words: Trump, Orangutan. But frankly, I believe it was purposeful because now you’ve got a bunch of normies talking about – and trying to defend Valerie Jarrett – a woman who I can guarantee most of them knew nothing about until this very morning. Combine this with Roseanne asking for Q to contact her MONTHS ago, via Twitter. Then she tweets about all the children Trump has rescued, causing Leftists to lose their minds. And look at how they take the bait every single time! No, I can almost guarantee you this was purposeful and planned. Ah, a possible #HelperAnon! There’s only one post from this ID. Is it an unusual living arrangement? Well… not everyone lives with a former president, plotting to oust a current president. Does she have additional protection beyond what is normal for a retired political advisor? A former top aide to Harry Reid took a parting shot at fellow Democrat and White House Senior Adviser Valerie Jarrett on Thursday, questioning exactly what she has been doing for the last eight years. The obvious answer is because she’s more than just an adviser. Who are her protectors really? The “Cult.” What I call #TheCabal. Ostensibly, to the Dept. of Homeland Security. But now, with Trump in charge, that can’t be happening. Who to they really report to? Probably to the Rothschilds/City of London. Can she go anywhere without a detailed track record being kept? I imagine not, no. Not with the NSA watching. Q has confirmed that she’s tried to use private emails, and secret twitter handles, as well as burner phones. Private email addresses while she was in Govt Service? Probably the secret Gmail account Q disclosed. Active subversion/treason by coordinating with the Muslim Brotherhood/Awans/Huma. Is it possible that these secret messages are not so secret anymore? “The 16 year plan.” Coordination with the Muslim Brotherhood, internationally, and MS-13. Do burner phones really give you total anonymity? Do secret twitter accounts give you anonymity? What is her main focus now? What does she want to accomplish? Her main focus is taking down Trump. To put The Cabal back in a seat of power. The most interesting question of the bunch… Obama’s not going back in that seat. Hillary could be a potential candidate, but with her health issues, I think everyone knows she’s on her way out. Kerry floated the idea of he, himself becoming president. So who are they trying to raise up, next? And what’s most stunning to me, even re-reading this now, is the 2004 bit, from Q’s post. When did the AWAN’s mission op go green? 2004. Oh look, she was Chairmen of the Board for the Chicago Stock Exchange. What a coincidence! She also happened to be serving as Finance Chair for President Obama’s run for the U.S. Senate in 2004 – uh – before he was President. And it’s important to note here, that Obama didn’t really hire Jarrett, which is what you would normally do. No! Remember, Both Hussein and Michelle were up-and-coming lawyers before their political careers. Yes, by the time Obama was running for office, I’m sure they were paying Jarret, but it’s important to remember that THEY were hired by Jarrett first, in 1991, when she was working for the Chicago Mayor’s office. Valerie Jarrett became the President and CEO of The Habitat Company on 01/31/07 and served as Executive Vice President of Habitat for 12 years. Prior, she served for eight years in Chicago government as Deputy Corporation Counsel for Finance/Development, Deputy Chief of Staff for Mayor Daley. She was also Commissioner of the Dept of Planning and Development and also practiced law with two private law firms. From 1995 – 2003, Jarrett served as Chairman of the Chicago Transit Board. Jarrett also served as Chairman of the Board of the Chicago Stock Exchange from April 2004 – April 2007 and was a Director of the Federal Reserve Bank of Chicago from January 2006 – April 2007. While Jarrett was CEO of The Habitat Co. which managed Grove Parc Plaza from 2001 – 2012 and also co-managed a Chicago subsidized complex that was seized by Feds in 2006, after city inspectors found widespread problems. Feds graded the condition of the complex an 11 on a 100-point scale — a score so bad the buildings faced demolition. Officials at Woodlawn Preservation say the government [Valerie] didn’t give them enough money to properly maintain Grove Parc. Jarrett’s Habitat Co. declined to comment on Grove Parc in particular but said it is hard to manage something you don’t own. She was under consideration to take over Barack Obama’s vacated seat, but that got too scandalous for her to be associated with. Jarrett had the whole city of Chicago under her control by the time she was chosen to be in the White House as Obama’s closest Cabinet member. Sounds like a lovely place, right? A real communist utopia. Valerie Jarret’s communist father-in-law, Vernon Jarrett died in 2004. And that’s just her father. The FBI also investigated her grandfather, and father for Communist activities. We already know from previous Q drops that the fall of the Soviet Union was a fake-out; that they went full-on subversive during Glasnost. So basically, Vernon Jarrett was a Commie subversive for years, and raised his daughter to be one as well. So when he died in 2004 – did a passing of the proverbial torch occur? Did she come into the full inheritance of her #RedLegacy then? 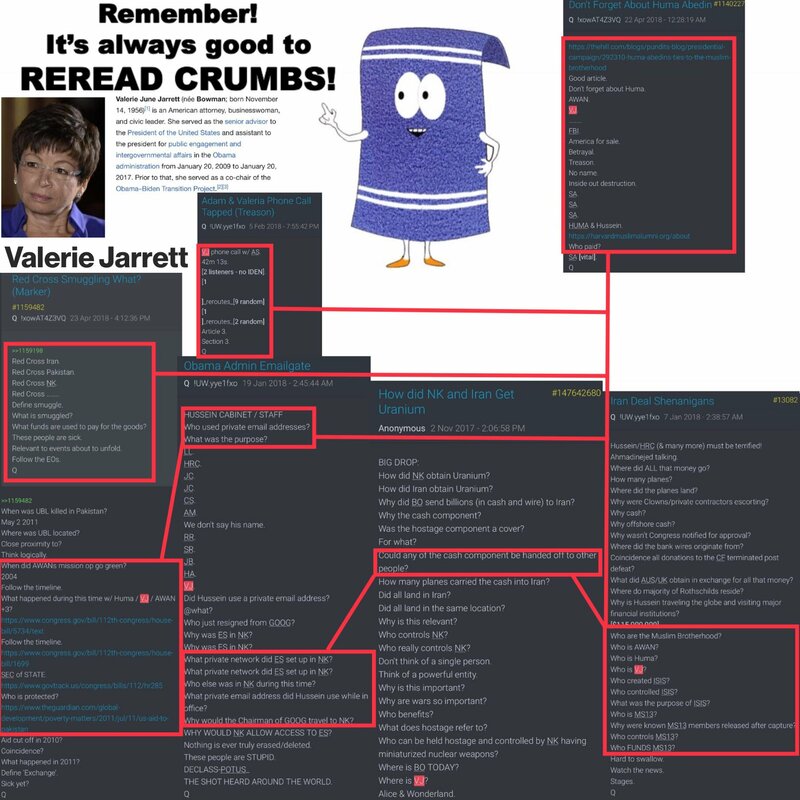 Jarrett’s gone from Stock Exchanges, to Federal Reserve Banks (aka, she’s a Rothschild Puppet), to Senate and Presidential campaigns, to… living in Obama’s spare room, trying to take down President Trump. Private comms will prove she’s colluded with the likes of the Muslim Brotherhood and MS-13, trying to plot and coordinate the destruction of America. And tons of normies who had never even heard of this woman are now trying to defend her on Twitter. LOL. But I want you to understand that this implies that the “16 year plan” to destroy America has been in the works for a very, very long time – and they are desperately trying to get their timeline back. The 16 year countdown STARTED with Obama. 2004 was four years before he was elected. And he had to be groomed for this life long before then. Just appreciate for a moment the amount of work and the amount of time the Cabal and our enemies put into reaching this diabolical goal. DECADES have gone into them plotting our utter destruction and enslavement. But it’s not gonna happen! Do me a favor and redpill your normie friends with this article, especially those who may be trying to defend communist-subversive Jarrett today. Rattle their cages a bit. Help them #Awaken. It’ll be fun, I promise! Previous articleAI: The Greatest Job Disruptor in History Now!